The advertising campaign for the first Gears was centered on a strangely affecting sixty-second spot in which Fenix twice flees from enemies, only to be cornered by a Corpser, a monstrous arachnoid creature, on which he opens fire. But it was the soundtrack—Gary Jules’s spare, mournful cover of the 1982 Tears for Fears song “Mad World”—that gave the spot its harsh-tender dissonance. This helped signal that Fenix was something that few video-game characters had yet managed to be: disappointedly adult. He takes the level of discourse around video games to a whole new elevation. He makes me want to play Gears of War. That second point, I think, is the the height of non-fiction writing about any subject—whether it’s art or sports or technology or business: the writing drives the reader towards its subject. Joe the Plumber, who gained notoriety during Wednesday’s debate is, according to today’s Times, a bit of a fraud. Later in the article he refers to himself as feeling like Britney with a headache. I still know him as the guy who Jon Stewart derided on Crossfire for wearing a bow tie, but Tucker Carlson actually displays some great wit in his review of last night’s debate over at Tina Brown’s new venture, The Daily Beast. But the strangest moment of all came when McCain raised Rep. John Lewis’ slur against him. If someone called you a bigot, likened you to George Wallace and the Alabama church bombers, would you describe him, non-ironically, as “an American hero”? Yes, Lewis behaved honorably during the civil rights movement. But the sad truth, known to virtually everyone in Washington, is that Lewis is a mediocrity as a congressman, and has been for many years. It would have been nice to hear a little straight talk from McCain on that subject. Incidentally, if you think that’s an unfair description of Lewis, tune into to C-SPAN some time and listen to him speak for 20 minutes. Then ask yourself an honest question: Is this man really smarter than Sarah Palin? He’s not. Not that any of this matters for the purposes of the election. It’s over. Obama won. 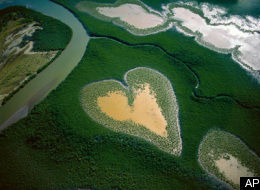 Yann Arthus-Bertrand’s exhibit Earth from Above is coming to New York in May 2009. I saw the exhibit in Paris in 2000, and can’t wait to see it again. 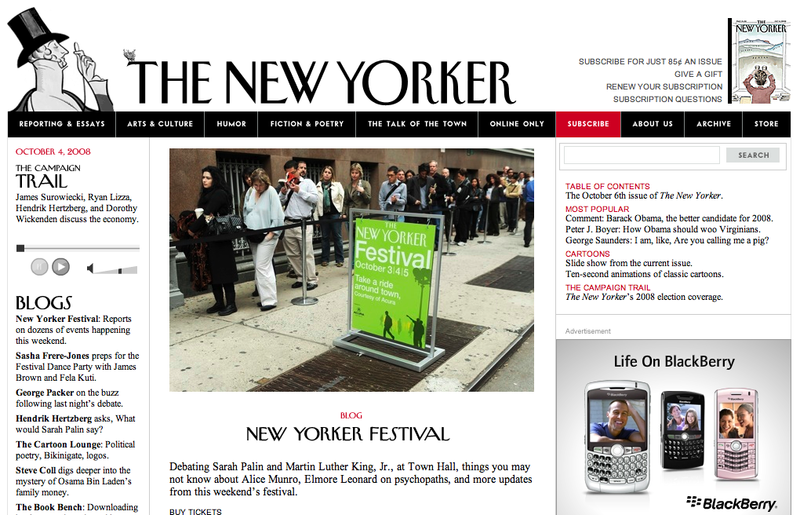 On Saturday, I attended a panel discussion moderated by Jeffrey Toobin about the current presidential campaign that was part of the New Yorker Festival. Donna Brazile, who ran Al Gore’s campaign, stole the show.
. . . when [Palin] was asked about Obama’s attack on McCain’s claim that the fundamentals of the economy are sound. “Well,” Palin said, “it was an unfair attack on the verbage that Senator McCain chose to use, because the fundamentals, as he was having to explain afterwards, he means our workforce, he means the ingenuity of the American people. And of course that is strong, and that is the foundation of our economy. So that was an unfair attack there, again, based on verbage that John McCain used.” This is certainly doing rather than mere talking, and what is being done is the coinage of “verbage.” It would be hard to find a better example of the Republican disdain for words than that remarkable term, so close to garbage, so far from language. Obama’s deputy speechwriter Adam Frankel worked with Sorensen on his memoir, and Sorensen himself has lent his hand to the Obama campaign. 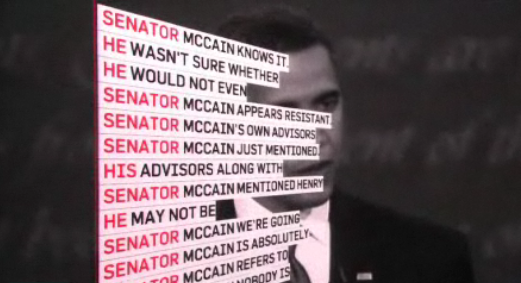 Sosolimited has been performing live visual remixes of the presidential debates. Today’s takes place at the Art Directors Club in New York. Tickets are still available. If you’re a California resident living somewhere else or even a California resident who, for whatever reason, can’t vote in-person on November 2—vote from your couch, your office, wherever—please vote by mail. The deadline for your request to be received is October 28. So, hurry! The Times has a story about Ernest Hemingway’s baseball field in Cuba, which I somehow didn’t even know about before. Hemingway rounded up a dozen boys from the barrio to play baseball with them. And just inside the black and white gates of the farm, Hemingway set up an odd little ball field where he would pitch for both teams as they whiled away the hot afternoons. This Sunday’s Times Magazine features a cover story about Kleiner Perkins’ bet on green tech. Of course, Fortune already did this story in July. It took me a little while to find the audio track from the Yes We Can video, so I thought I would post the “Yes We Can” MP3 here for anyone who’s interested. I still can’t believe Sarah Palin is running for second-in-command after her display of foreign policy credentials and her inability to name any Supreme Court cases during her interview with Katie Couric. Meanwhile, I’m still hoping that Richard Holbrooke will be our next Secretary of State. Sarah Palin apparently winked during some of her responses. Seriously, what is the woman thinking? Joe Biden strongly advocated intervention in Sudan. However, Palin a) lied about her support for the divestment of Alaska’s Sudan-related investments and b) did not use the word genocide to describe what is, plainly, genocide. I was disappointed that Gwen Ifill didn’t press the candidates on this issue. Joe Biden’s description of his family history towards the end of the debate. I didn’t think much of it at the time, but one day later, it’s sticking with me as a raw, unscripted, and completely moving moment from an evening often filled with attacks and boring talking points and transparent evasion of questions. This, more than Palin’s “white flag or surrender” or Biden’s attack on McCain’s Iraq policy, is what I remember from the debate.